Now that the media's honeymoon with Lewis Hamilton has soured somewhat, other young drivers are receiving attention. In a recent poll of fans regarding "the best" driver of the moment, I noticed that Robert Kubica has become one of the favorites, out-stripping Hamilton for number of votes. This is interesting, given that Kubica's history is very different from the British star's. Lewis is often accused of having everything handed to him on a plate; while I do not think that this is a completely fair assessment, there is no doubt that his McLaren backing assisted greatly in his path to F1. In contrast, Robert's rise to fame was much more of a struggle and he achieved success largely through his own efforts. The strength of Robert's belief in himself can be imagined by consideration of his decision to move to Italy at the age of thirteen to further his career. He did this on his own, his family being unable to accompany him, and set himself the task of learning a new language at the same time as securing support from CRG, an Italian kart manufacturer. As an outstanding new talent, Robert came to the notice of Daniele Morelli who agreed to become his manager for his progress through the usual single seater route of Formula Renault 2000, Formula 3 Euro Series and the World Series by Renault. He won the WSR championship in 2005 and was given a test by the Renault F1 team - at which point, the BMW team stepped in and signed him to a test driving contract for 2006. That was the heyday for test drivers, their last hurrah perhaps, with plenty of mileage and exposure at GPs as the teams used them to the full. Robert rapidly became very noticeable indeed, often topping the Friday times in a car that was a long way from being the best. With Jacques Villeneuve seemingly off form in one of the race seats, Dr Theissen suggested that Kubica be given a few race drives to extend his experience. That was the moment when all Robert's hard work paid off. Jacques refused to be replaced even for one race and stormed off in a huff; Robert became the second driver with several races left in the season. And we all know what happened - those races became a phenomenal debut for the Pole, including a podium finish at the Italian GP, and the F1 world sat up and took notice. Yet 2007 was not an easy year for Robert. Expectations were high that he would have the legs of his experienced team mate, Nick Heidfeld, but this was not the case. For most of the year, Nick stayed ahead and ended the season with 22 more championship points than his young team mate. That was last year, however - this season Robert has been the quicker of the two and is in contention for the WDC. The difference between Robert's and Hamilton's careers is perhaps reflected most obviously in their public statements. While Lewis has been criticized for some ill-judged remarks, Robert shows a greater maturity and clarity of purpose that is beyond reproach. When asked about the possibility of a drivers' strike over the increase in license fees, Robert made it very clear that he was there to race and money was very much a minor consideration. It may be that as expectations of the Pole increase, he might be distracted by the hype - but I doubt it. It is his level head that has brought him to this stage in career and there is no reason why he should be diverted after such a long battle through the lower formulae. He is a well-balanced, serious young man with a talent that grows race by race and is likely to be one of the top F1 drivers for a long time to come. Mr. Michael Gooding (previous comment above) lost all credibility with his remark, "specialness of his skin color". I would have welcomed a new friend to the site but some civility would have been nice to start. Kubica does seem MUCH more mature that Hamilton. the media attention of course might drive anyone mad but the girls and the million dollar home and moving to a Swiss hideaway, and some off track actions, it just seems he's trying to play the part before EARNING it. About two weeks ago I read a quote from his friend Fernando Alonso and I have spent days trying to find it as a reference but the gist of Alonso's remarks were "I (Alonso) am baffled how he (Hamilton) got 9 podiums in a row. He wasn't capable of it, he didn't deserve it. This year (2008) he's acted like the rookie he is, last year was a fluke". I've paraphrased a but bit the understanding is correct. Frankly I agree with Alonso, last years McLaren was probably a bit better than last years Ferrari, it gave Hammy the slight margin for a good driver to excel, this year the McLaren is behind Ferrari and the kid IS a rookie again. Side by side with Robert Kubica ........ I see night and day. I believe someone said Hamilton has been under McLaren's wing for 10 years, even only 5 years ....... what a head start that is against anyone else who has to come up through Minardi or the like, or as Kubica did........on his own. Number 38 has a good point. While McLaren's support for Lewis was conditional (in fact, Hamilton and McLaren nearly parted ways in 2004 over a disagreement in which series to do next), he's had a lot more reliable support than Kubica. 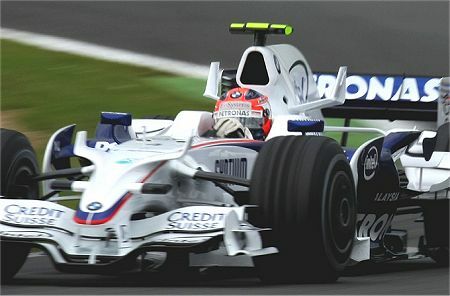 Not only did Kubica not receive any support at all until F3 level, but his initial supporters, Renault, abandoned him at the end of 2002. Flavio Briatore must have been cursing when Mario Theissen scooped up Kubica soon after a test that proved Renault had been wrong to drop him! While BMW have given Kubica good support since 2005, Robert had to do a lot of travelling along the feeder formula path before receiving it. Whereas Hamilton did four years of karts. It's not just the fact of doing certain series and attaining certain results that affects how drivers do when they reach F1, it's how they did it and how they then apply those lessons. Cake mixture from a food-processor tastes very different to the same mixture mixed by hand. I don't think 2007 was a fluke, but I do think he had more help from his circumstances than a rookie can usually expect. A double world champion to model his racing on (I'm not convinced they shared telemetry at the end, but I think they did at the beginning), a team that expected little from him because he was an unproven rookie and a chassis that had to be better than the last one because people had trouble believing the 2006 McLaren was so bad in the first place. While Hamilton did more stuff right than would usually be expected for a rookie, the further the season got from what he'd experienced before, the further off optimum he went. This indicated that he had some way to go before the prodigious rookie became the next Michael Schumacher. 2008, I think, shows what would have happened if Lewis had been in Kubica's circumstances for that first season - good, but not noticeably better than those who'd gone before. Of course, he has the disadvantage over Kubica that he's in a team that's unexpectedly dipped (something he's never experienced before) whereas Kubica's team is on the rise and has been ever since he joined. So Hamilton's learning curve has been interrupted and he's struggling as a result, while Kubica is extending on what he's already learned. Michael: Like you, I have no idea what really goes on in any team behind closed doors but I did not mean to imply that Hamilton is immature or unstable - it is merely that Kubica (so far) has seemed the more mature of the two. I think that Hamilton gets far more good and bad press than he really deserves, mainly because he arrived on the scene with such a splash. He has set peoples' hopes high and it is no surprise that he is now finding it difficult to live up those hopes. He remains an exceptionally talented driver and we will see how well he copes with adversity - it is too early yet to tell. Kubica, however, has already demonstrated considerable resilience in his comeback from the worst accident in F1 for many years and in his steady learning process through many other setbacks last season. I think they are both outstanding talents - easily the best of the younger generation. If they get themselves into good cars then they will contest the world championship between themselves over the next few years - a la Prost and Senna. They are both devastatingly quick, have unbelieveably agile racing brains and are like chalk and cheese - yet remarkably are good friends and have a healthy respect for each other. Added to that, their style behind the wheel is like night and day - Lewis has the rear of that car dancing like raindrops on a pavement, whereas Kubica is mindblowingly aggressive, always pushing on the front end. I think we really are about to enjoy a golden era of racing (Bernie and Max notwithstanding) - the closeness of last year and this year (to date) just being the start of it. In 2002 I was at Interlagos waiting for the final round of the Brazilian Formula Renault championship. There´s an invited driver named Robert CUBICA whom (with a car that he never saw before) was the devastated fast one at any time that the cars were on track. Free practices, classification and race. This guy took the pole and in the start took “S” of Senna and none could touch him until the end of the race. He finished 12 seconds ahead of the second man in a race with 17 laps. Obviously we wanted to know a little bit more about him but we just discover that he was from Poland (what a weird thing!) and Formula Renault driver in Europe. I only heard about him again when he were at BMW as a test driver. But when a saw him driving as he did at his debut, I was not surprised. Interesting story, Becken. It's always great to identify a rising new talent early on - makes you feel a part of it somehow. As regards Hamilton's recent comments to the press, I agree that they were ill advised. Never bite the hand that feeds you is the rule! I did cautiously add Max and Bernie notwithstanding Clive ;) If they would just stop all of these shenanigans and let the drivers and teams race, what a wonderful world it might be! And I think that you are right - provided he gets back in a frontrunning car - that Alonso still has plenty left to say!